If you have information or images to share, please do so at CNN iReport. (CNN) -- A U.S. Navy aircraft carrier resupplied a crippled cruise ship that is slowly being towed to San Diego, California, officials said Tuesday evening. The USS Ronald Reagan received 60,000 pounds of food, bottled water and supplies by airlift for the cruise ship Carnival Splendor, with its nearly 3,300 passengers and nearly 1,200 crew members, Cmdr. Greg Hicks, spokesman of the U.S. Third Fleet, said. The Carnival Splendor was stranded some 130 miles west of Ensenada, Mexico, earlier Tuesday, a day after it lost power following an engine-room fire, Carnival Cruise Lines said in a statement. The ship and USS Ronald Reagan were about 150 miles south of San Diego Tuesday evening, Hicks said. The vessel is expected to arrive in San Diego late Thursday, said Carnival spokeswoman Joyce Oliva. The Reagan reached Carnival Splendor late Tuesday morning and supply deliveries were made by helicopter throughout the afternoon. Any supplies not delivered by sunset Tuesday were to be made Wednesday. "It's gone very well so far," Hicks said. Sailors stood on the deck of the USS Ronald Reagan in 50-yard lines, handing off boxes of water, frozen bread, sandwich meats, granola bars, paper plates and more for the Splendor. "We were on maneuvers necessary to get the crew ready for deployment," Lt. Cmdr. Kate Meadows told a CNN reporter on the carrier. "But we were more than happy to respond and excited to be a part of helping the cruise ship." Sailors who have been in contact with Splendor's passenger and crews reported no major problems, Meadows said. At least six sailors spent the night on the ship. The provisions were made available by Carnival Cruise Lines. One tugboat "is in process of tow," Coast Guard Petty Officer Rachel Polish told CNN. Another tug is en route and will speed the slow process, she said. Carnival said it is making hotel and flight arrangements for guests once they reach port. It's possible the Splendor would be diverted to Ensenada if it cannot maintain sufficient speed under tow, according to a statement. The fire occurred about 6 a.m. Monday in the aft engine room of the Splendor, the cruise line said Tuesday in a statement posted on its website. The blaze was extinguished and no passengers or crew were injured. Oliva did not know the cause of the fire or when repairs might be completed once the ship is back in port. Officials said no passengers were evacuated from the ship for medical or any other reasons. Engineers were not able to restore power to the ship, which was operating on auxiliary generators, a Carnival statement said. As of Tuesday, "several key hotel systems, including air conditioning, hot food service and telephones are not available," the cruise line said. Engineers were able to restore toilet service to most cabins and all common-area bathrooms, as well as cold running water, the line said. "The ship's crew continues to actively work to restore other services." Guests are able to move about the vessel and children's activities and entertainment are being offered, Carnival said. Announcements advising guests of the situation began early Monday, the cruise line said. Guests initially were asked to move from their cabins to the open upper deck areas of the ship, but later were given access to their cabins and were able to move about the ship, Carnival said. Bottled water and cold food items were being provided. The voyage -- a seven-day cruise along the Mexican coast that departed Sunday from Long Beach, California -- was terminated, Carnival said. Carnival also has canceled a seven-day cruise that was to leave November 14 from Long Beach, California, the company said. At the request of the Coast Guard in San Diego, the Navy diverted the Ronald Reagan from training maneuvers. Thirty-five pallets of supplies were delivered to the aircraft carrier from a nearby Naval air station, officials said. Guests will receive a full refund and reimbursement for transportation costs, and will also receive a complimentary future cruise equal to the amount they paid for this voyage, Carnival said. "We know this has been an extremely trying situation for our guests and we sincerely thank them for their patience," Gerry Cahill, president and CEO of Carnival Cruise Lines, said. "Conditions on board the ship are very challenging and we sincerely apologize for the discomfort and inconvenience our guests are currently enduring. The safety of our passengers and crew is our top priority and we are working to get our guests home as quickly as possible." 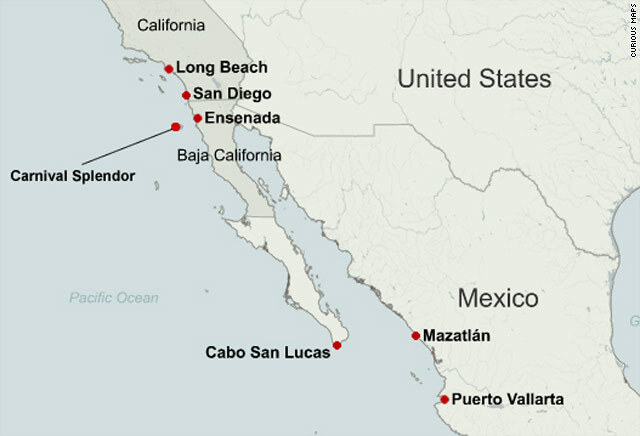 The ship's normal itinerary included stops in Puerto Vallarta, Mazatlan and Cabo San Lucas, Mexico. The 952-foot Panamanian-flagged ship is carrying 3,299 guests and 1,167 crew members, according to the cruise line and the Coast Guard.